East Timor is becoming an increasingly popular destination for diving and snorkeling trips, and part of the novelty is that it’s also one of the world’s youngest countries, since it separated from Indonesia in just 2002. East Timor also makes a decent place for a visa run if you’re wanting to extend your stay in Indonesia. I spent 2 days there in 2018 on a visa run from Bali, and while Dili was far from my favorite place, I found the visa and arrival process to be pretty straightforward. This page will explain how you can get a visa on arrival in East Timor, which is good for a stay of up to 30 days. Read on! Who Can Get The East Timor Visa On Arrival? Any nationality can get a visa on arrival in East Timor, and the cost is the same $30 USD for all nationalities. Length of stay is 30 days. If you need to stay longer, you can also extend this or just apply in advance for a 90 day visa. Since 2015, European Union citizens do NOT require a visa to visit East Timor for up to 90 days in a 180 day period. Citizens of Cape Verde can also visit East Timor for 30 days without a visa. The 90 foot tall Cristo Rei statue in Dili is one of the main landmarks in the country. The first step to visit East Timor is booking a flight. 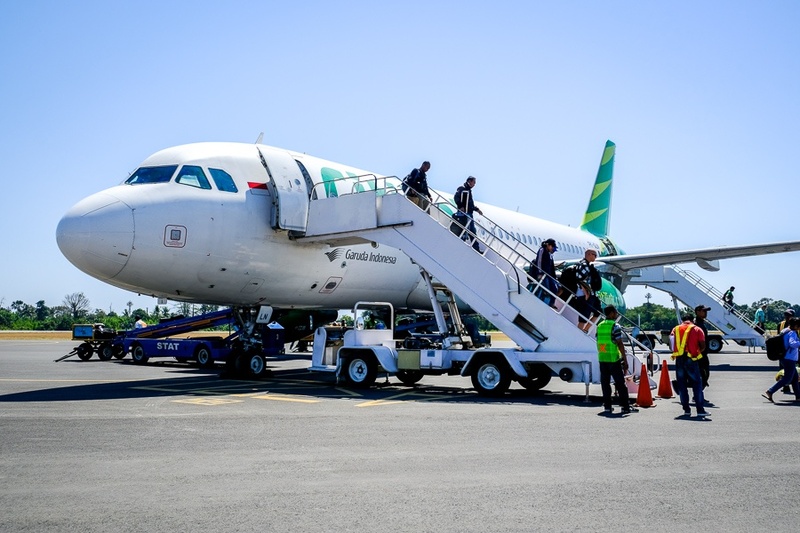 The only international airport in the country is Presidente Nicolau Lobato International Airport in Dili (DIL), and on top of that, there are only two main routes for flying to Dili — the first being Bali (DPS) and the second being Darwin (DRW). Both of these routes take 1-2 hours of flying. I flew to Dili from Bali with Citilink, which is a low cost brand of Garuda Indonesia airline. You can also fly this route with PT Nam Air or Sriwijaya Air, but Citilink has a better reputation and the prices are similar. You should definitely try to get a window seat when flying in this part of the world. Amazing views! First of all, you will need $30 USD cash in hand. The visa fee is only payable in US Dollars. There are no ATMs before you reach the immigration counter at Dili airport, and ATMs in East Timor are generally not dependable anyway. A $20 transit visa is supposedly available for stays of less than 3 days, but in practice they don’t actually honor this unless your stop in East Timor is truly a transit stop while going from Point A to Point B.
I stayed in Dili for only 2 days and 1 night, so I technically met the qualifications for the transit visa based on my short length of stay, but the immigration officer made me pay for the $30 visa anyway. There is also a student visa for $40 or a work visa for $50, if you fit into either of those categories. The flight to East Timor with Citilink went smoothly. When you arrive in East Timor, you’ll be given a small immigration form. This is just a simple form where you’ll be asked your name, passport number, flight number, and accommodation address, as well as some routine immigration questions like how long you plan to stay there and whether or not you’ve been deported or convicted of crimes anywhere in the past. Technically you’re also required to have funds of at least $100 USD for entry as well as $50 per day to cover your stay in East Timor, but I think it’s rare for westerners to be quizzed about this. I wasn’t asked at all. If you don’t look like a westerner, however, it may be a good idea to have a bank balance handy just in case. The line at the immigration counter is usually pretty short. After handing in your form and paying the $30 visa fee, you’ll be on your way. Dili has some great white sand beaches a short distance from the city.